As the seasons change, so does the cost of our energy bills. Each summer our air conditioning units do their best to keep us cool while our furnace works overtime all winter to help keep us nice and warm! 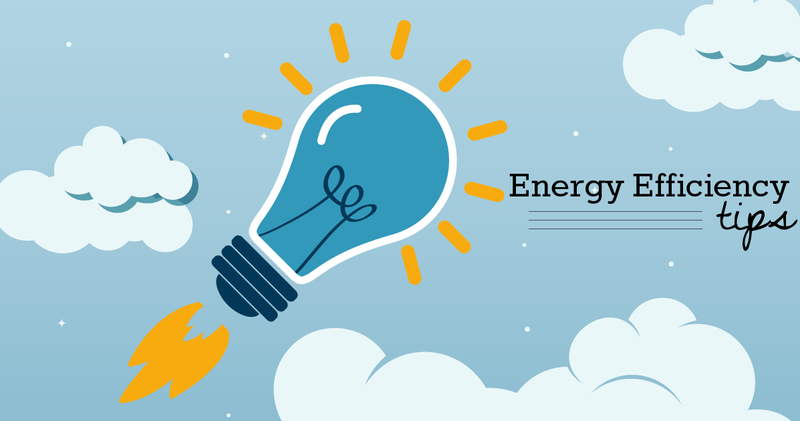 When our furnace is working in overdrive, our overall energy bills have a tendency to shoot sky high. Find out how to help create the most energy efficient home possible to save money, in the long run. Follow along to see what tips to utilize in creating the most efficient home possible while lowering your overall energy cost. Air leaks are one of the worst culprits of energy inefficiency. Even the smallest of cracks in door jams, windows, and siding can cause significant loss of heat or cool air; therefore increasing energy costs. Do a walkthrough of you home to feel for air leaks on a day when the temperatures are either very high or very low. If your windows are over 15 years old, it might be time to look at options to replace them for more energy efficient windows. While the upfront cost is intimidating, the savings, you can see, in the long run, are worth it. Remote thermostats are an easy way to be more efficient with your energy use! A programmable thermostat like Nest or Google Home allows you to raise and lower the temperature in your home according to your daily activity as well as gain valuable usage data to help you cut costs over time. Several options are even programmable via smartphone so you can program them while at work or on vacation! The incandescent light bulb were once the go to and quite frankly, only option for years, but it’s now a thing of the past. LEDs are now the bulbs of the present and future. When compared with the incandescent, LED lights can save upwards of $4 a year ... per light! There are several ways to help save energy when it comes to doing laundry in your home. The first way is rather obvious. Use less water: If you’re running a small load of laundry, be sure to change the load size accordingly. If you’re continually running any size of load as a large load, you’re wasting money each time you do laundry. Do not over dry clothes: Not only does this waste energy, it’s likely to shorten the lifetime of your clothing due to shrinkage. Line dry clothing: Not having to use your dryer is an obvious way to reduce energy costs. If your space is limited, consider purchasing one that can extend during use but roll away once out of use. Clean out the lint trap EVERY time you do laundry: Cleaning out the lint trap helps to maximize efficiency each time you do laundry. Finding an ideal water temperature has more to do with comfort than you may think. Setting it at an ideal temperature will help reduce energy costs. However, there are strong recommendations in place to prevent the spread of disease. According to the World Health Organization, if water sits stagnant in your water heater at too low of a temperature, Legionnaires’ disease, has a greater chance of occurrence. Temperatures above 70 degrees Celsius cause the Legionella to die almost instantly. If temperatures fall below 42 degrees, Legionella will thrive. It’s recommended to set your temperature at 60 degrees Celsius for maximum efficiency while maintaining water safety! Turn off water while brushing your teeth. Wash vegetables in a large bowl instead of continuously running the tap. Use leftover water from above to water houseplants. Turn off water when scrubbing dishes and wait to rinse all at once. Anytime you leave the room, be sure to flip the switch behind you! Turning off lights behind you, automatically saves you energy while extending the life cycle of the bulb itself. Even when appliances are turned off, they still continue to use power all day long. By using a power strip, you can turn off all appliances to the wall outlet with the flip of one single switch. This helps to limit unnecessary energy waste and maximize energy efficiency throughout the day. The experts at Space Simply can help! Reach out to us online or connect with us by calling (515) 423-0899 today.